Steel shelving systems are great for industrial, office, retail, or food service organizations. They are durable, adaptable, and easy to configure for use in any environment thanks to their adjustability. All manner of materials and items can be placed on these shelves. The greatest advantage they bring to businesses is the transformation of empty floor and vertical space into inventory control areas. Consolidation and accessibility helps employees find materials and supplies, thus making operations become streamlined and efficient. This makes work less frustrating and improves morale. Safety also improves when thing are no longer left lying around to cause trip hazards. Also, in the event of fire in the building, wire will not burn and it will not block sprinkler systems. There are many other advantages of a steel shelving systems. · Units mounted on casters are mobile. · Steel wire is easy to clean. · Steel wire is shiny and aesthetically pleasing. · Steel wire can handles chemical storage, food storage, and wet storage. · Steel wire is every bit as adjustable as solid shelving. · Steel wire can be configured in all sorts of ways. · Steel wire can be mounted in many different ways. · Steel wire can transform both walls and corners in to storage areas. 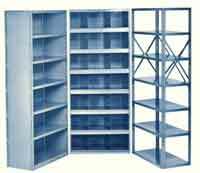 Steel shelving systems are used in a very wide range of business types and applications. · They are extensively used in the restaurant industry. · Health care systems use them as well. · They are ideal for the storage of computer parts. · Offices require wire storage units for storing supplies and paperwork. · Mobile wire units are used to store and move objects that require transport. Many people are amazed to find out that steel shelving systems are used in restaurant storage. Everything from cooking utensils, cook ware, and food products have to be stored and inventoried. In the restaurant business, this has to be done with rapid turnaround to keep the business going. Trucks are constantly stocking and restocking supplies as food is prepared and consumed. In the back of a restaurant, we often see activity that is busier than the shipping and receiving dock in a small warehouse. Because metal shelves are available in all in all sizes and can be mounted in any number of ways, even a small restaurant can use these shelves to store and organize even the most limited or oddly-shaped items in the kitchen or the storeroom. Steel Shelves and Steel Shelving Systems Made In The USA. Steel Warehouse Shelving will transform floor space along interior walls and large sections of your vertical cube from wasted space into efficient, organized, reliable storage space. Both Industrial steel warehouse shelves and long-span/ wide-span Easy Rack units can be interconnected to create larger, more powerful steel shelving systems specific to the dimensions of your individual facility. The most important factor to keep in mind when you buy steel shelving systems is the size and type of unit mounting that offers you the most efficient conversion of vertical and horizontal cube space into storage space. Answering a few simple questions can help guide the decision. · If it is a small space, would individual shelves that mount directly to the wall work best? · Is the ceiling height high or low? · Is the storage room a small room where a wire unit on vertical stands can convert space along the back wall? · Do you need to transport stored products? Knowing this will help narrow down options to the best possible unit for the task. The Mettler Toledo parts scale we purchased a few months ago ..